Two months ago, I attended a women’s cycling event at a local bike shop and was thrilled to meet Aussie pro cyclist Rachel Neylan. I was really impressed when I heard Rachel recount her story of determination to reach the top echelons of Australian women’s cycling. I was also impressed to find out that she was the driving force behind the event I was attending, and she was leaving Australia the very next day to begin her European season. On the night Rachel agreed to an interview and here’s the result….. I was always a passionate and determined athlete but barking up the wrong tree in athletics through my teens. Knowing what I deeply wanted was to be a world class athlete and Olympian, I made it my mission to seek out a sport better suited to my physiology. I did some research and in late 2007 found a talent identification / talent transfer program at SASI. I moved from Sydney to Adelaide a month later and threw the kitchen sink at it! Read more here with Rachel’s bio from her own website. Q: I believe you’ve had some injuries that you’ve managed to overcome. Please tell us about the issues and how you overcame them? Yes my career has been quite the journey, punctuated with several injuries, a product of crashes, minimal experience and always throwing myself in the deep end. Knowing why I chose to change my life to become an athlete and remaining true to that innate purpose has been the key to my resilience. Having an indomitable desire to achieve mastery in athletic performance and always being open to learning is an important element which I’ve adopted. Also having my background in sports physio I’ve been able to apply good knowledge to my rehab plans when its been needed! Read more with Rachel’s latest post on her website. Q: What are your main goals for 2017? Resume racing at my top level and achieve a UCI podium result and to compete in the World Championships. Q: How do you find being part of an Aussie team? I kept knocking on the door, was persistent in overcoming obstacles and spoke with my legs by winning the Cadel Evans Great Ocean Road Race in 2015. Q: Where are you based when you’re in Europe? Is that your main training ground? Lucca, Toscana. Yes! Aside from high altitude camps in Livigno or Tenerife. I take one rest day per week where I try to do something totally non cycling related. Q: What can we do to encourage more women to ride bikes of all kinds? Promote importance of high viz and daytime lights for safety. 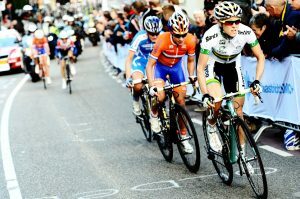 Did you enjoy the interview with Aussie pro cyclist Rachel Neylan? Would you like to hear from others? Share via comments or the Women Who Cycle Facebook page.